Happy Sunday! I’m back again with another installment of Sneak Peek Sunday where I review a book that has yet to be released! 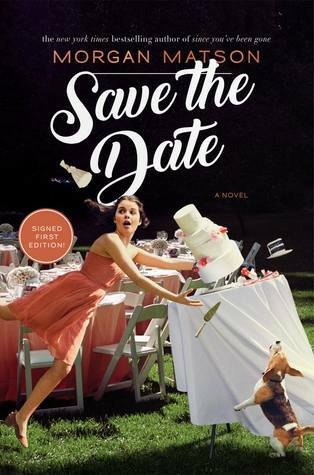 Today I’ll be talking Morgan Matson’s upcoming release Save the Date. I received this copy for something related to Justine, and I can’t wait to share that with you! This is her newest book after The Unexpected Everything which came out in 2016. Without further ado, let’s jump right in. This was such a cute little contemporary book! I read it during finals weeks, and it was the perfect was to finish it off. I read it for something super fun I got to do for Justine Magazine, which I hope I’ll get to share with you soon. This book focuses on Charlie’s sister’s wedding. I don’t know about you, but I love weddings. My favorite part of the entire party is the reception. It’s when everyone is relaxed the most and unabashed. I feel like the worst that could happen during a wedding happened at Charlie’s sister’s wedding. From a power outage at the venue to mixed up decorations, Charlie manages to help fix it all. I loved the Grant family to bits! They reminded me of my own family to be quite honest. I’m the youngest of five, and while it’s no longer a full house here, we still see my siblings often. It’s never a quiet moment with such large families! I love the Grants’ traditions and their little quirks. I would have loved to be part of their fictional family. Charlie herself was a fun character. She was an overachiever, but someone who is also afraid of change. I can’t say that I blame her, there’s a lot of change senior year not to mention moving from her childhood home. It’s a crazy time, and I can see Charlie struggle when she has to think about it. I love the way her character changes over the course of the novel. There are also a lot of little Easter eggs from Matson’s other books in here so be sure to keep an eye out for them! Hi there, happy new book Tuesday! There are so many amazing books coming out today, including Strange Fascinations (YAY NOAH AND DAVID!!). 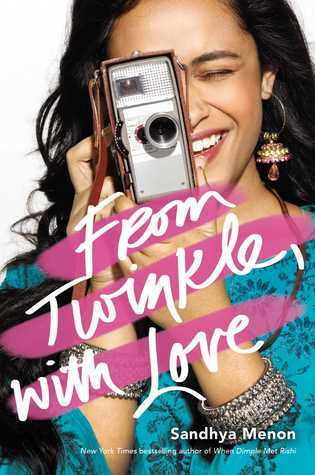 Today I’m happy to usher in this lovely new read, From Twinkle, With Love by Sandhya Menon. 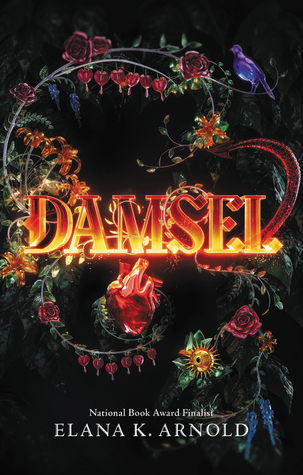 I had the opportunity to read When Dimple Met Rishi early as well, and guys, this book does NOT disappoint! Listen, I really loved this novel. You need to go buy it right now. Like, what are you doing reading this review and not buying the book? NOT TO BE DRAMATIC, BUT YOU SHOULD GET ON THAT RIGHT NOW! I WILL WAIT!!! Ah yes, welcome back! I’m so glad you decided to get this book! It’s truly wonderful, and I love every bit of it. I can’t wait for you to love it too. Twinkle was a truly fun character. She grew so much throughout the story. While it was written in the first person, I feel that you can tell through the dialogue how she changes and grows. I love how she finds her voice directing the movie. (I totally wish this remake existed because I would watch the crap out of it!!) She definitely had her flaws and her frustrating moments, but in the end, I like what she made of it all. The story is written in an epistolary format, and at first I wasn’t sure if I would like it. However, right away I was proven wrong in any doubts I had. I love the way the style feeds into the narrative as a whole. While it is mostly sort of a diary, you still get a lot of dialogue, setting, and description. I love how it makes Twinkle more personable and it made the whole thing more intimate. One small complaint about the book is how mature the teenagers acted. I feel like that was a little bit of a reach, and while I do wish things were resolved like this more often in real life, I don’t think it would always happen like this. I absolutely 100% love the diversity in this book. While this is mainly about a Desi girl there are many other characters within the story that bring in more rep to the story. It is well written and not forced. Menon expertly weaves in different rep within the book, and I really appreciate it. Well, that’s all I’ve got for now folks. If you didn’t get yourself a copy go do it now! Links above!! Hello there and happy Monday! I’m 14 reviews behind, but if I write this one there is one less in that massive stack. 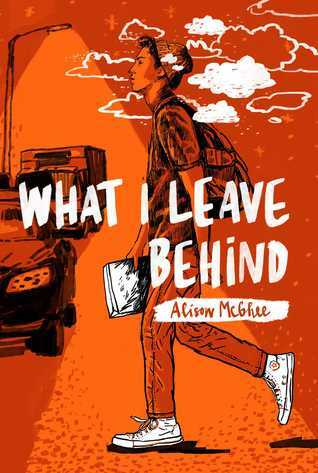 I’m so glad to be here today with a review of What I Leave Behind by Alison McGhee. This book was sent to me for review by the publisher, but does not have any affect on how I read and review it. Thank you Simon Teen for sending me a copy! This was a really, really quick read for me. I sat down with it one afternoon and knocked it out. To be honest, I didn’t know about the 100 word chapters, and in retrospect, I have mad respect for McGhee pulling it off. It’s super easy to get lost in the words and describe everything, but this book was all about being concise. I appreciate how she did it and I applaud her for it. That being said, I do wish it was a little longer! I feel that I couldn’t get a huge feel for Will throughout the book. I wanted to get to know him more beyond what was given. I also wanted to know the other characters more. One thing I liked about the book was the constant action. Because the chapters were only 100 words long every word counted. There wasn’t much time spent on descriptions of things or people, it was almost always action. I liked the pacing of the book as a whole, and I liked how Will took you backward in time to explain some things. I wish I had gotten to know Playa more! She seemed like a really fun character, and a lot of what Will does is because of something that happened to her. I understand that this is Will’s story in the end, but maybe there can be a book about her in the future?!?!?! All in all, this was a good book, but it didn’t wow me. I wanted more from it, and while I appreciate how hard it must have been to write it, this didn’t quite get there for me. I encourage you to read it yourself though! It may be the book for you!! Hey, everyone! I’m so excited to be here today with a review of The Strange Fascinations of Noah Hypnotik. 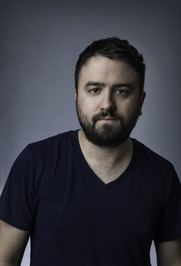 David Arnold is one of my all-time favorite authors, and I’m so glad to be part of this tour. I first fell in love with Arnold’s writing with Mosquitoland, and if you haven’t read that one yet I highly recommend it. However much I loved his first two books, I think this one is my favorite?!?!?! Now Noah → sees changes–inexplicable scars, odd behaviors, rewritten histories–in all those around him. All except his Strange Fascinations . . . This was a fantastic book. I sped right through it, but I wanted it to last so much longer. I wish it was longer. PLEASE MAKE IT LONGER I LOVE THIS BOOK!!!!!!!! I have to say that this is hands down one of the best books I’ve read this year. It’ll be one of them at the end of the year, too. The writing style was different from the first two books Arnold wrote, and I like the slight change. The chapters were short and sweet, but I wanted them to last longer (see above). I think this fit the entire narrative of the story in general, and I think it being written in a typical way would take away from the book a a whole. Noah is a great character. He is looking for himself, and through the entire book, it seems he will never get to the end. I think this speaks true to what it’s like to be a human in general. There’s something very honest and true about Noah that made me love him more. I was wondering what would happen when Noah got hypnotized. At first it doesn’t seem like much has changed, but little by little you see something more unfold. I would love to talk more about this, but I feel it would give away the story altogether. I think this was one of the best parts of the book. I had a feeling something like this would happen, but I wasn’t sure. All in all, I am psyched for you guys to get into this world. It’s amazing. GO PRE-ORDER YOURSELF A COPY!!! Hi guys! I’m so glad to be here with you again this weekend to bring another great book. First and foremost, thank you The Novl for sending me an advance copy of this book for review. This has no inherent influence on how I read and review the novel. Today I’m talking about the wonderful Cecilia Vinesse, author of Seven Days of You, which debuted last year. I even had the chance to interview Cecilia for Justine at her event in Naperville when she toured with her book in the U.S. 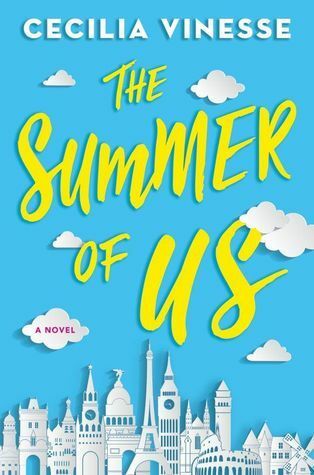 This June, Cecilia is releasing her second book, The Summer of Us. This book made me want to travel so bad! I haven’t been outside of the U.S. before and I’m dying to see what’s out there. It made me think of road trips across the U.S., and made me wonder what it would be like to do with my friends. I’m really looking forward to it, but I can see where things could go awry quickly. 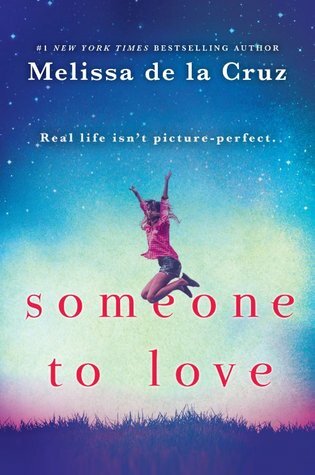 It’s written in dual points of view in the third person, and I like that it was limited to only Aubrey and Rae. I feel that it was their story to tell, and while it would have been nice to hear from Clara or Jonah at some parts, I think it would have gotten too messy and lacking in cohesiveness. I love stories about best friends. I’ve had many best friends over my life time, and I think this is something that everyone can relate to. Growing up and growing apart from people is really hard, especially when the person is someone you hold in such high regard. Vinesse writes the dynamic between Aubrey and Rae and their friends so well, and I love the different ways they interact with each other. Something else that I liked was that it deals a lot with the change after high school. After just going through it, I can attest how weird that period of time is. Everyone is hopeful for the future, but worried about what will come. I wasn’t scared to come to college per se, but I was nervous about making friends. It feels like a huge step in life to just up and move away from everything you’ve known, and I think this is captured perfectly in the book. 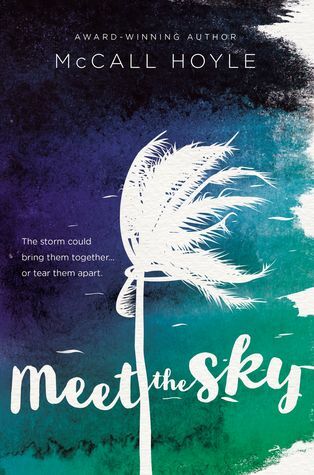 Overall, I loved the novel and the story itself. 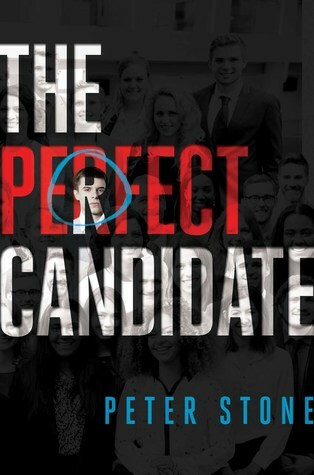 This is a perfect book to read this summer, and I really hope you check it out! Hi there! What better to start off the New Year than with a review! Happy release day to this lovely book and so many other ones. This book was interesting. I was sent a copy for review thanks to the publisher and publicist! Something that I liked was the truth to Olivia’s story. Her journey is a hard one, and I like the way it was captured. More thoughts to come, Happy New Year everyone! One thing I realized later in the book was that it was set in the same universe as Something in Between which was released in fall of 2016. (You can read my review of that book here.) This was one of my favorite aspects of the book. It was four years in the future, and I loved how you got to know the minor characters in that book much better through this book. Liv is a very dynamic character. She is very stubborn and is worried about showing vulnerability. It’s something that speaks true to what it is really like to be human. I can’t personally speak on what it’s like to have anxious thoughts, but I feel that this book conveys it well. You read about Liv and her thoughts come so naturally that it doesn’t feel forced at all. The supporting characters were well written as well. I feel that they have very common reactions that anyone from the outside would have. It seems that they represent all of the different ways that someone could react. Generally this was a good read. It was something I had to pick up and put down a few times, but I was compelled enough to finish it. I wanted to know the outcomes of all of the different characters, and Liv was a lovely character.